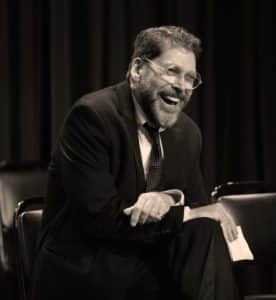 David Staller is the founding artistic director of New York’s Gingold Theatrical Group, which produces the monthly juggernaut series, PROJECT SHAW, at Symphony Space, now in its 14th year. Created in 2006 to champion human rights and free speech using the work and humanitarian precepts of Shaw as its platform, GTG is the only organization to have produced performances of all of Shaw’s 65 plays, all directed by Staller. He has also directed full off-Broadway productions of HEARTBREAK HOUSE, MAN AND SUPERMAN, MAJOR BARBARA, YOU NEVER CAN TELL, and WIDOWERS’ HOUSES which were all filmed by the NY Library for Performing Arts archives at Lincoln Center. He oversees the annual Shaw New York Festival, which includes full productions, new play development workshops, seminars and symposiums, and educational programs. He has also produced and directed many plays and special events around the world and is frequently invited upon the international theatre and socio-political scene as a speaker about equal human rights and all things Shaw. He also teaches at SUNY Stony Brook and the Acting Shaw classes sponsored through GTG. He has produced and directed many plays, concerts and special productions in New York and around the world, including (for the Motion Picture Academy of Arts and Sciences) the French National event at the Deauville Film Festival honoring the 50th anniversary of the D-Day Allied Invasion. He studied acting and directing with Stella Adler and Uta Hagen in New York, Lee Strasberg in Los Angeles, and at RADA in London. As a teenager, he was in the apprentice Joffrey Ballet Company in New York. He then joined the Rostropovich master ‘cello class at USC. While studying at USC, he became ‘script doctor’ for several film and television production companies. Coming back to New York, he returned to acting, appearing in three Broadway plays, almost 50 off-Broadway plays, and many regional theatre productions. He was given a Drama League ‘distinguished performer’ citation for his performance in GASLIGHT at the Irish Repertory Theatre Company in New York. He has appeared in many television shows and commercials, particularly voice-overs. He has also had a successful career as a cabaret and concert headliner. He performed his one-man show, NOEL&COLE, at Carnegie Hall in 1993. During all of this, he continued writing and became a scriptwriter for Turner Entertainment. David is also a long-time member of The Actors Company Theatre in New York. He is a frequent guest lecturer at schools, clubs and organizations, and has become the go-to speaker for all things Shaw. Mr. Staller, who lives in Manhattan, adapts all scripts for GTG’s Project Shaw, which are registered. To lease these scripts for performance please contact GTG.